Elegant petit fours are little bite sized cakes made to simply admire briefly before popping whole, into ones mouth. Popular at High Teas and Cocktail Receptions, they're experiencing a bit of a revival, having disappeared from all but the five star buffet dinner spread for a decade or two. Traditional Petit Fours are really nothing more than cubes of sponge or madeira cake, coated in icing, then lavishly decorated to suit the occasion. You could start by cheating and buying a madeira cake (or any other really), making your own easy rolled fondant rosettes, and dipping the cubes of madeira in your own runny icing. Allow them to dry a bit, then top with your rosettes. Pretty. Hand drawn flora on sugar cubes is a nice touch. More modern petit fours with vivid turquoise icing and metallic hand dusting, show that it doesn't have to be about pretty pastels and roses all the time. 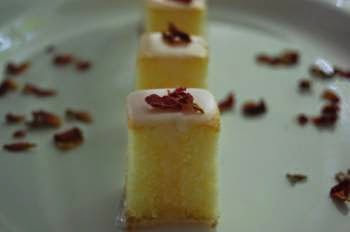 Bake a sponge or butter cake in a slab pan, allow it to cool, then cut into small, dainty cubes. Make a thin icing from powdered sugar and water, divide it into three bowls and tint each a delicate pastel shade for the ladies, or a more vivid hue for the men . Place the cake cubes on a platter, and spoon a little icing over each, allowing it to drizzle down the sides. Decorate each cube with a tiny sugar rose, edible flower petals (edible rose petals are available from many specialty tea shops), metallic pastel cachous, edible metallic paint and pearl dust, or crushed nuts. Enjoy! I am glad to hear that petit fours are coming back. I love the pink coconut diamonds with the rosettes--so pretty! These all looks absolutely divine! Pass the plates and so glad you linked. These look so beautiful and sound delicious! Swoosh Roses...DIY painted roses and buds..